Task management is one of the core features available in our online project management software, Intervals. We’ve built a comprehensive set of tools around managing task workflows. With attributes like status, priority, and history, Intervals is perfectly suited for projects where a simple checklist of to dos simply won’t do. One task management feature unique to Intervals is the ability to categorize your tasks using what we call Modules. Task modules provide a way to slice your tasks into meaningful segments most applicable to your task management workflow and reporting. Modules are a customizable list of categories that can be assigned to each task. 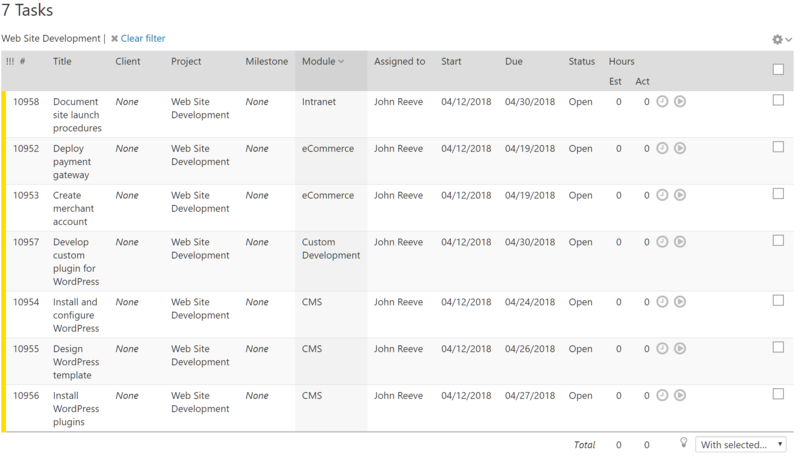 Because task modules are available to all projects, this gives you a way to use common task categories across all projects. When you are in task management mode, for example, you can filter your task list based on the most relevant category. This is especially helpful when you need to zero in on a subset of tasks. Perhaps the most beneficial use of task modules is the value they add to reports. 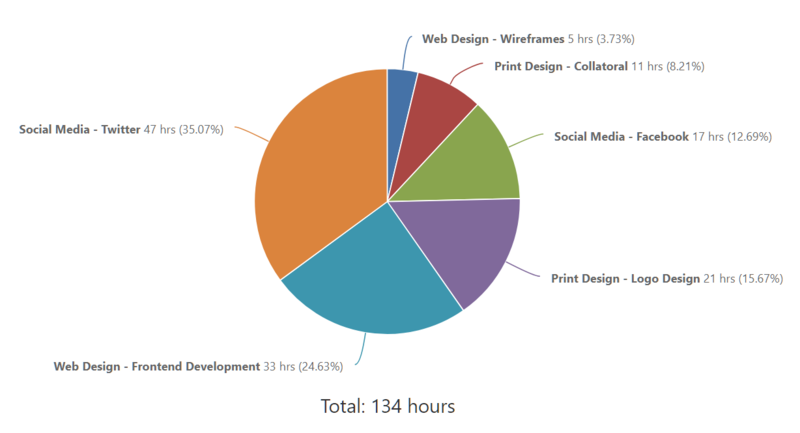 With each task categorized, we can see how much time we’ve tracked in each category across all projects. Most creative agencies are full-service agencies, which means they are working in every type of media — print, digital, and social. Task modules are useful for categorizing tasks by subsets of media. This would give the agency the ability to filter tasks — for example, to view any upcoming copy-writing tasks to push out tweets. Now, let’s say the creative agency is looking back on the previous year and wants to know how much time they billed by media. Because they’ve categorized their tasks, the data is only a few seconds away. With a few clicks the data might show that writing tweets was the most profitable category, and designing business cards the least. Companies that provide IT services are unique in that they offer more open contracts so they can provide whatever services the client might need. One minute they are fixing a jammed printer, and the next they are configuring a mail server. A project manager can use this information to prioritize tasks based on a subcontractors availability. If we know that our Systems Administrator is in the downtown corridor for the afternoon we can assign and prioritize their task listing according to their expertise. When running a retrospective, a task snapshot report segmented by modules can reveal exactly how many printers were unjammed and how many new servers were deployed. A web development agency could use task modules to categorize tasks based on the type of web site they are building. For example, some tasks can require expertise in CMS, eCommerce, intranets, or custom development. The web development agency using Intervals would have immediate insight into which category of tasks took the most time, or which category had the most overdue tasks. They can use this data to improve their workflow and become a more efficient team. The overall goal of using task modules to categorize tasks for easier task management and let the data guide your future efforts. In the present, the process of managing a large number of tasks can be simplified by focusing in on one category of tasks. The post-mortem process is also improved by task categories, because they give us insight into what worked, and what didn’t, from a unique and informative perspective. That kind of data goes a long way towards estimating future work and making more informed business decisions. Is it not possible to assign billable or non-billable to specific tasks? Right now our Intervals seems to default to billable for all tasks. We have a task “Non-billable Support” which defaults to billable until the user deselects billable. Often this is missed creating more work. It would be nice if while setting up a task you could assign billable or non-billable to that task. The billable / non-billable setting with Intervals is set at the project level. Here is a help resource that shows the functionality https://help.myintervals.com/time-tracking-faqs/set-project-billable-unbillable/. It is a basic preference that controls the default behavior of the add time dialogue for a given project. This preference can be overridden when applying time to a particular task but there isn’t a way to flag a task as billable or un-billable other than using the task title or task summary to indicate if it is billable or not.